Thanks to the Foodbuzz’s Tastemaker program that I got these awesome Buitoni’s Wild Mushroom Agnolotti delivered to me. 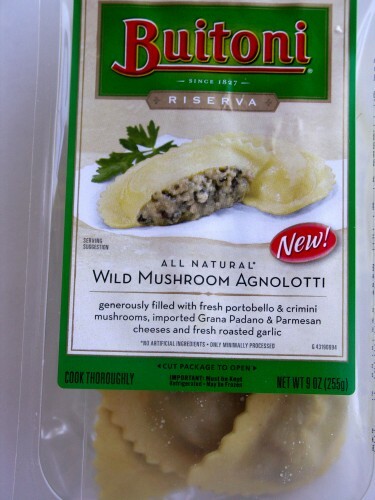 These are “generously filled with fresh portobello & crimini mushrooms, imported Grana Padana & Parmesan Cheeses & fresh roasted garlic.” Actually I cannot wait to buy more of these! I am not usually a big fan of filled pastas, but this did beat anything around. These were just delightful, bursting with the earthy tones of mushrooms & garlic. The mushrooms & the roasted garlic were really some serious business here, & unbelievably delicious. I could just eat them boiled. It is what what it says on the package that they are just as good with a drizzle of olive & herbs. 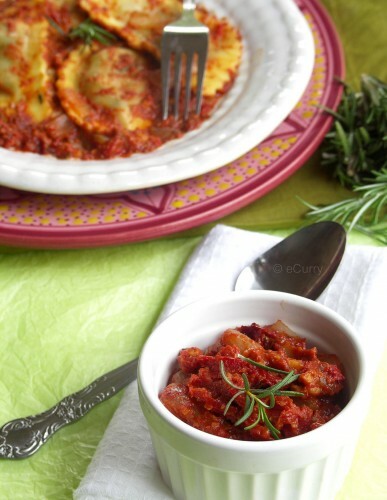 However this time I did make my own sauce for these raviolis this time-with my favorite combination of Roasted Red Peppers & the Sun Dried Tomatoes Pesto as the base for the sauce, along with some exotic flavor of Saffron this time. Note: I had about 1/4 cup of sauce left over after using with the given amount of Agnolotti. Prepare the pasta according to package instruction. Drain the pasta & save the drained liquid. Grind the Almonds, but NOT to a powder. Let them be chunky. Set aside. Soak the saffron in 1/4 cup of warm water. Set aside. If you are not using sun dried tomatoes in oil, it needs to be reconstituted first. Soak them in 1/2 cup of warm water for about 20 -30 minutes. If you are not using store bought roasted red peppers, Roast them at home, Peel the blackened peels, slice them in to strips & set aside. In a blender/processor, process together the sun dried tomatoes, roasted red peppers, two tablespoons of olive oil, & the balsamic vinegar. Add some water water if it gets too dry. Do not make a Puree. This too needs to be kept kind of chunky. Set aside. Add the rest of the Olive Oil to a pan. Add the Garlic to the olive oil, & let the garlic heat up with the oil . This infuses the flavor of garlic in the oil. When the oil heats up, you will see the garlic sizzling slightly. Do not let the garlic brown. Add the onions immediately when you see the oil heat up. Stir them together for a minute, & add the red pepper flakes, salt & black pepper. Toss them for about 2-3 minutes till the onions soften & are translucent. Add the red wine to the pan. After a minute add the pesto of sun dried tomatoes & roasted red peppers and the water with soaked saffron. Stir to combine, & cover & cook for about 5-7 minutes at medium heat. Uncover & add the almonds. Add 1/2 cup of the drained pasta liquid & the chopped rosemary. Add the sugar & salt. Simmer for another 5-8 minutes or till you reach the desired consistency of the sauce. 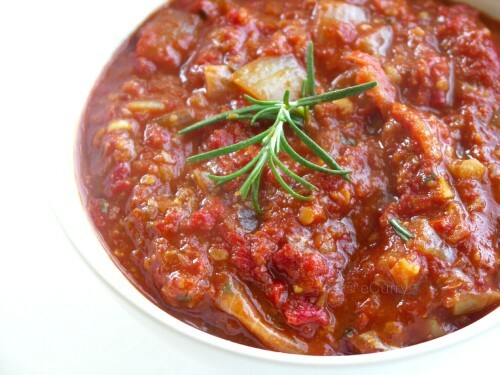 This is what my sauce looked like, chunky, rich & full of texture & flavors! Add the Agnolotti/Pasta to the sauce. Simmer for only a minute or two & serve immediately. Every bite satisfied all the senses of the palate. The flavors of the sauce & the agnolotti infused in just right – there was slight hint of the saffron, & the roasted garlic in the pasta filling was very very good. There was something very physical about the texture, chewy, with the crunch of nuts & everything delicious. I seriously loved the taste & feel of almonds in the sauce. I am kind of partial to the combination of the roasted red peppers & sundried tomatoes, but this time the addition of saffron & almonds kind of culminated the prior combo. That pasta does sound good, but your sauce in particular gets my complete attention! Gorgeous. yaa..It was so so tasty..I got this too n made for yday dinner n absolutely loved ’em. :)..I made it with chicken peppers..will post tat soon..:)..I was so impatient for the first time to eat it n the pics r so clumsy..Seeing your yummy pics..my..I am totally hooked…!!! Oh wow, that looks so good! 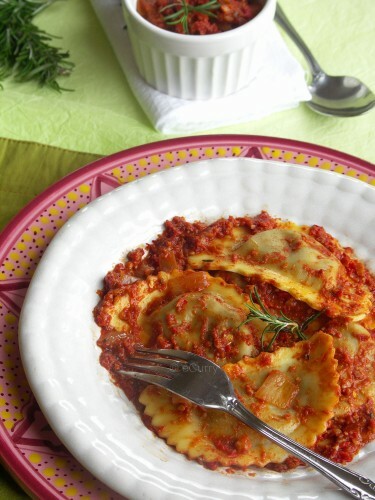 I love stuffed pastas, and these sound so delicious with all the different mushrooms!! Love the color of that pasta sauce. Just delicious. Have to get some sundried tomatoes and try this sauce. Looks great man! The nuts must have lent such a crunch no? That looks awesome. The sauce looks so yum . Photos are lovely as usual. I got these too, haven’t tried them yet though. I love what you did with them! Loved those agnolotti too! Your sauce sounds excellent! Love what made the sauce. slurrp… I am loving the pasta and that sauce is awesome. I read that ingredient list and it’s making me drool even more. It all sounds delicious. Nice addition with the almonds. This looks delicious…and receiving free (good) food is always a bonus. I feel like screaming – GIMMEE SOME, SOMA!! Looks fantastic..Love pastas..the sauce sounds YUMMMM! Awesome clicks make me hang here Soma…so so yummy to taste that one..would love to taste.. 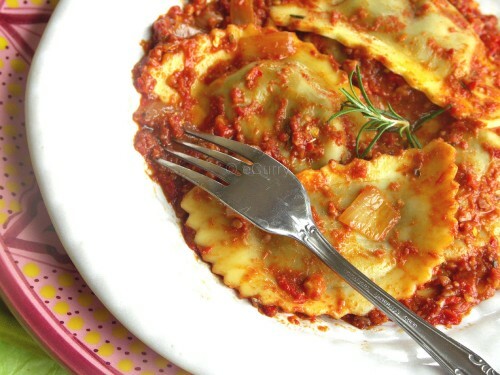 I adore filled pastas, specially agnolotti . I can eat pasta everyday and must to do exercise accordingly…..
A big and super touch the sauce with dried tomato and red peppers, a re-comforting dish! wow ! This is innovative !! I loveeeeeee the sauce there…wow !! yummy ! This is such an exquisite dish and an outstanding photograph. Thanks all of you 😀 I cannot wait for these agnolottis to come to the store! The base combination for your sauce sounds amazing. It has that nice thick texture that I like on pasta. Just what I need to cool my rumbling stomach. Very pretty and appetising. saffron is such a great addition to the pasta sauce!! Soma your pictures are beautiful! I love mushrooms , I have to try the buitoni filled pasta. Mouthwatering pics! Wish i had a bite right now! Wow…this looks absolutely fabulous!!! Totally drool worthy pic! I can understand why this pasta won the contest – it is really beautiful. I served the sauce with tagliatelle rather than a filled pasta; the sauce on it’s own is so full of flavour that we really didn’t need anything else to go with it besides good egg pasta and some shaved parmesan. The rough almonds give the sauce a great texture while the mix of vinegar and chilli adds a great punch of flavour. I couldn’t see in the recipe how much saffron to use so I just added a good pinch to the soaking water. Thanks for a delicious and very easy weeknight dinner! Thanks for letting me know. 🙂 A pinch of saffron is good . ( I will update the post with – sorry about that). MAde this tonight.. but did not have saffron. Even without it , it tasted soo good. Hubby also loved it ! Thanks for the recipe. 🙂 Glad you liked it. Thank you. hi, everyone this is apil from uae presently working in liwa hotel as a chef de partie i am really appreciate with this site as well all the visiter , hope in future will get many more useful receipe as well picture.